You are here: Home » Blog » CONTROVERSY: Is the nappy (flight / diaper) suit bad for your bird? Charlie’s spot in my car. I did not know it was a controversial topic when it comes to the nappy (flight / diaper) suit for birds until recently. I truly thought it was a great idea to put a nappy suit on my bird and go outside together. Yes, I understand there are a few tricky points like choosing the right size, training your bird to get used to it and so forth. Of course some birds won’t accept the nappy suit at all, but I don’t quite understand why some people are so much against for it? I talk to myself if you say putting on the nappy suit is not natural for birds, then keeping a bird in a cage itself IS NOT natural either. 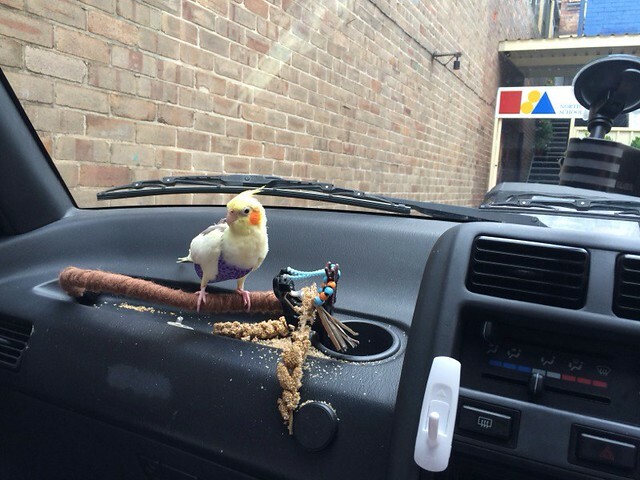 You shouldn’t keep birds as your pet. Am I wrong? My bird, Charlie wears the nappy suit about 6hours a day (3hours each time), stay off nappy suit for 6hours, sleep time is 12 hours. He is very happy bird because he can stay with me most of the time (inside and outside). He seldom stays in a cage during a day. I make the nappy suit because I have got so much benefits out of it and I would love to help other people as well.